Mercedes-Benz and motor sport are synonymous with each other. It is almost impossible to have a conversation, at the start of a new century, that looks back on the history of the sport, including Formula One, without the famous German marque's name joining the list of subjects under survey. And one man, steeped in the traditions of the business and the company, who knows as much about Mercedes-Benz and motor racing as anyone else, is Norbert Haug. The head of Mercedes-Benz motor sport today, Haug loves nothing more than to reminisce about the old days, or take an opportunity to drive an ancient Mercedes-Benz around the old Nordschleiffe circuit at the Nurburgring, re-living the old days with his own undimmed ability at the wheel. He is an enthusiast with a passion for his job and his company's business. He is as ebullient as he looks, too, his celebration parties famed in the Formula One paddock whenever he has the chance following a Mercedes' success. He knows, too, that Mercedes's relationship with motor racing has come as much in short, sharp and spectacular bursts as through steady progress. Even before the turn of the last century, following the creation of the earliest motor cars in the late 1890's, when Daimler and Benz led the German crusade, it was clear that Germany and the early car-makers were to enjoy a close relationship with racing and time-trials. "Historically, Mercedes has been closely linked to motorsport," says Haug. "Everything started with competition back in 1914 and the company has been involved throughout racing history ever since." Like many others involved in Stuttgart, Haug prefers not to dwell for too long on the history of the company's involvement on the bad days when black clouds descended or the involvement of Adolf Hitler in the development of German cars in the 1930s. Then, for example, such was the level of pride and expectation, that the team withdrew from Avus, where it was expected to dominate in the 750kg formula of the time, because of fears about engine reliability. It was deemed less embarrassing than being outstripped by Alfa Romeo. Perhaps worse, still, was the Le Mans disaster of 1955 when, having only returned to Grand Prix racing the previous year, 80 spectators died after Pierre Levegh's Mercedes car went into the crowd at the French circuit. It was, by a cruel irony, the year in which Stirling Moss joined the great Juan-Manuel Fangio in the Grand Prix team and when he won the British Grand Prix at Aintree in front of 150,000 people. Following Le Mans, however, Mercedes-Benz withdrew from racing as a constructor. The comeback was to be via sportscar racing in the late 1980s and early 1990s, when Haug was recruited to run the programme. are coming into Formula One and are following our example shows that people think highly of Mercedes. They look at the work we are doing with McLaren and it is easy for them to see how far we have come. "I've been involved for 10 years. Since I started work with Mercedes, the company has been very successful as it has throughout its history. We've won 10 important international titles - we've won in DTM, in the CART championship in America, in 1997, and we have been champions in the GT Championship twice. "Of course, we've won in Formula One too, with McLaren. It is a good record. 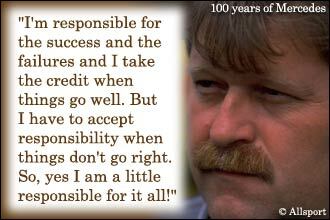 "I'm responsible for the success and the failures and I take the credit when things go well. But I have to accept responsibility when things don't go right, as at the start of last year, with McLaren. So, yes I am a little responsible for it all! "We had a difficult start in 2000, but in the end it was a fantastic season. We didn't win the championship, I know, but it was still a great competition with Ferrari and that kind of racing is what Formula One is all about. It is a pure sport and anything can happen. "Ever since 1997, we've been in a position where we could have won every race. It is not very often you will find that in Formula One. That is about 50 races in total and ever since Mika (Hakkinen) won his first Grand Prix in 1997 we have challenged for victories. "The two drivers we have are two of the best. They were with the team when the car was not as good as they have become and, in fact, when the team wasn't winning. They deserve the seats. They are both capable of winning the title. Both will be given an equal opportunity to win it. I know we are very happy with them and so are McLaren." 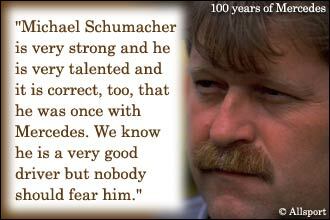 Like most Germans, Haug is proud of the achievements of his national team and their top driver, Michael Schumacher. Unfortunately, for him, Schumacher drives for Ferrari and is the Stuttgart-based company's chief rival when it comes to Formula One on the track. But Haug holds no special respect for him beyond recognising that he is one of the fastest and finest drivers in Formula One. "Michael Schumacher won this year, but he is not in a special league," he explains. "Mika and David can match him and our driver line-up is as strong as ever. Michael is very strong and he is very talented and it is correct, too, that he was once with Mercedes. We know he is a very good driver but nobody should fear him. "We must remember that Ferrari have Rubens Barrichello and he is a very good driver too. He is the best partner Michael has had at Ferrari and he helped a lot last season." Looking ahead to the forthcoming 2001 season, Haug is uncertain about the likely effects of the tyre war between Bridgestone and Michelin, the French newcomers attempting to upset the status quo, of course. "Nobody knows the role Michelin will play in the championship battle. Of course, we want to win and we will try to prepare as best we can. McLaren and Ferrari were at the front last season and we will be on Bridgestones. "People say it will be Ferrari at the front again with us, but you never know how the Michelin tyres will affect Formula One. If they can get everything right it could help the others teams to get closer." 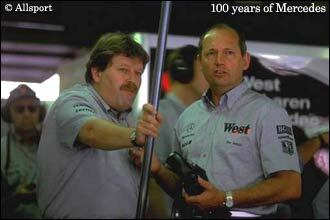 a technical exercise and, for Mercedes - and subsequently for Haug - it was the beginning of a new age. For the record, the drivers were Christian Lautenschlager, Louis Wagner and Otto Salzer and the triumph not only set new standards for everyone, it also gave the German people a fillip at a time when there was great tension with France and the event had heavy political overtones. Mercedes's chief rivals, of course, were Peugeot. Today, the chief rivals are Italians led by a Frenchman. And there is still great attention paid to technology, in particular, by attempting to ensure that the technical rule book is stable and unchanged and respected by all teams. It is a thorny issue, but one on which Haug has a view. "Very generally, we like to have rules within Formula One that applies to everyone," he said. "If you have something like traction control, which is very difficult to police, then the simple answer is to make it legal. "We believe that the only way forward is to allow it and then everything is out in the open. On things like that you have to ask: can you police it? Or can't you police it? The answer is to get everything in the open."